I had this queued up months ago, but it slipped by me. So, I'm posting it way later than I wanted. 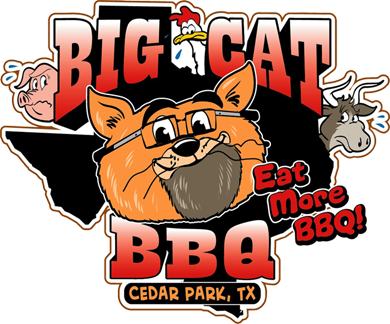 Nonetheless, I wanted to let you know Big Cat BBQ is open for business in Cedar Park. The menu includes black Angus brisket, beef ribs, pulled pork, St. Louis pork ribs, German-style sausage (with cheddar and jalapeño). They also have hot links and smoked turkey. Sides include beans, potato salad, slaw, buttered corn, green beans, and macaroni & cheese. Check them out on Twitter. And here is a map & contact information. Final day to vote in 2015 Readers' Choice Awards! Blue Ribbon Barbecue has closed. Brisket at a Spurs game! March 12 Texas Q Tours public tour! Thank you, Lockhart Smokehouse & Pizzitola's BBQ!